Earn $9.99 in Rewards credit (999 points) What's This? Designed to take abuse in stride. With the RD-M786 Rear Derailleur, Shimano has refined shifting in all trail conditions, borrowing features from last year's XTR group, while adding compatibility with new direct mount frames. The direct mount system allows the derailleur to sit about 25mm further back than previous designs, where it's less exposed to impacts along the trail. It also creates a stiffer interface between the derailleur and frame and allows for faster wheel changes, particularly on bikes using thru-axle systems. A pre-installed B-link allows for back compatibility with traditional derailleur hangers. Another new feature is the XTR-derived Shadow Plus stabilizer switch which can be enabled to increase spring tension and eliminate chain slap. The low profile design allows the cage to easily clear obstacles like roots and rocks, and a longer arm length results in great mechanical mechanical advantage, essentially giving the shifter more control over the derailleur spring for crisp, reliable gear changes. Sealed pulley bearings keep out mud, dirt and grime. 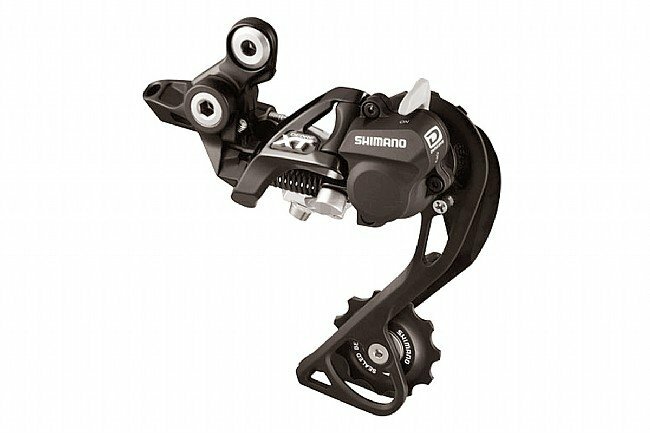 The Deore XT RD-M786 Rear Derailleur is designed for Shimano Dyna-Sys 10-speed MTN drivetrains/shifters. Available in GS Mid-Cage or SGS Long-Cage models. Black finish. Actual weight: 257g (GS with B-Link). Definitely worth the money. Shifting is so much better compared to the ZEE derailleur that I had before. Stops dropped chain and slap! Running the GS version on a 1x10 (11-36T CS-M77 and a 32T RaceFace NarrowWide) and with the CN-HG94 chain sized by 2 full links and shifts are butter smooth even under load and no chain slap or drops going throughout the entire range. Great derailleur and kudos to Wester Bike Works for stocking it! Hint for set up Cable retaining bolt, before you tighten, I suggest just slightly pull cable taunt... Initially I was pulling to tightly,,maybe 1-2 mm and I could not find the happy zone for adjusting the high low screws...soooooo just pull cable snug and tighten bolt. Second ride I mistakenly forgot to engage the clutch,,,opps,,, WELL it did not matter,,,Chain tracked like a pro and accomplished what I had bought it for. NOTE I also swapped out the triple crank and went with a single NARROWWIDE crank sprocket at the same time. Dropped 8 oz , cleaned up the cockpit and just simplified my ride.